The Chicago Department of Cultural Affairs and Special Events (DCASE) is pleased to announce the inaugural group of IncentOvate Program grant recipients. Chicago Children’s Choir, the Chicago History Museum, Lyric Opera of Chicago, the National Museum of Mexican Art and the Old Town School of Folk Music will receive competitive grants totaling $500,000 to support projects that further the goals of the Chicago Cultural Plan and Cultural Tourism Strategy. 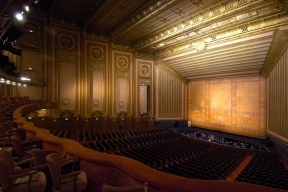 The IncentOvate Program is part of the Cultural Grants Program of the Chicago Department of Cultural Affairs and Special Events, which provides more than $1.7 million annually in direct funding to artists, creative professionals and arts and cultural organizations across Chicago – including the CityArts Program, which supports small to mid-sized nonprofits, and the Individual Artists Program. This new competitive grants program is made possible by Chicago Cultural Plan implementation funds in an effort to advance goals articulated in both the Chicago Cultural Plan and the Chicago Tourism Strategy. Applications for the Individual Artist Program are now open and are due in December, and the CityArts Program applications open on November 14 and are due in January. For details, visit chicagoculturalgrants.org.